The Bay Area is a mecca for vintage inspired venue choices. If you are planning a grand vintage affair, I would recommend the Julia Morgan Ballroom in downtown San Francisco. The room itself screams VINTAGE; however, the elaborate carved ceilings, fireplace, and lounge will seal the deal - they are gorgeous!! If you have a guest list in the 100 to 150 range, then take a look at The Montclair Women's Cultural Arts Club in Oakland. This beau-arts inspired venue is the perfect place for a soft touch of romance, or possibly a roaring 20's bash!! 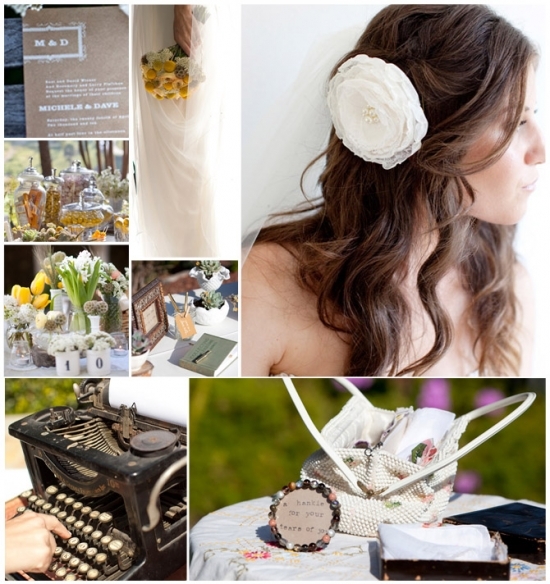 Most Vintage weddings seem to be inspired from a particular item, not necessarily the era itself. The antique engagement ring he purchased circa 1920; the stunning wedding dress you found at the vintage clothing shop dating to 1930; the 1940's hand-stitched veil you've had since you were twenty - each of these items carry an intrinsic sentimental value which will heighten your guests' experience and provide an amazing starting point for a wedding theme with a vintage flair. Amanda Bevington has provided us with these incredible photographs of a vintage wedding. The 1930's style typewriter is wonderful - a great prop when used to create your guest book: guests can type a note of well-wishes to the bride and groom, then gently press them between the pages of your guestbook. The pearl-beaded purse is a great location to hold linen handkerchiefs - alluding to the fact there won't be a dry eye in the house. Additional details for this wedding include small rhinestone-studded picture frames, and a collection of petite vases that hold single flowers - all of these small details will make a collectively large statement. The best part of this wedding is the bride's hairpiece: forgoing the traditional veil, she has expressed her vintage style with a soft loose romantic style simply adorned with a silk blossom. I Do Venues wants to recognize the talented team of wedding professionals who helped to make this bride's dream a reality: Photographer - Amanda Bevington, Florist - Megan of La Partie Events.